The 1992 model Mercedes-Benz SL is an icon of 1990s American wealth and consumer culture. Favored nationwide by image-conscious professionals in affluent suburbs, it was immortalized in popular culture — including the camp comedy hit Death Becomes Her (1992), in which Meryl Streep's reluctantly aging Madeline Ashton drives one recklessly toward immortality. In 500 SL #1 (1992), artist Peter Cain depicted this status symbol head on, in front of an indeterminate pale gray-blue background. The car is instantly recognizable yet slightly bewildering — elongated, compacted, and inflated into a beguiling version of its real-life counterpart. Cain painted the once-sleek coupe without its middle (and without the Mercedes-Benz symbol), fusing the remnants seamlessly together. This distortion is a signature element of Cain's work that has secured a lasting reputation for the artist more than a decade after his death. The painting's multiple horizon lines allow the viewer to look simutaneously under the bumper and over the roof. The artist has represented the car as a glowing sculpture, a larger-than-life monument to itself. Cain's futuristic restructuring of the car is equal parts optimism and paranoid speculation. The surface of the car is gleaming, free of key marks and other unappealing realities of everyday life. However, the Mercedes is also menacing, with its aggressively frontal depiction, utopian sheen, and apocalyptic absence of human life. Cain began his paintings with clipped and taped collages of car advertisements. He then refined the newly configured shapes through multiple drawings, which indicated the scale and size of the subsequent paintings. 500 SL #1 is coolly rendered, with a measured application of oil paint. A note imploring "More Courage and Less Oil" was found in Cain's studio after his death, which has suggested to art historians and critics that he was attempting to refine his practice by limiting the amount of paint he would allow himself. Cain's depictions of automobiles recall the adept brush handling seen in Robert Bechtle's 1970s paintings of suburban environments. Cain's paintings, often aligned stylistically with Photorealism, depart from the majority of works on canvas being made in the 1980s and early 1990s, especially the expressionist figural paintings by artists such as Julian Schnabel and Carroll Dunham. Cain's use of symbols of commodity culture recalls the appropriation popularized by the Pictures Generation artists of the late 1970s and early 1980s, particularly Richard Prince. However, Cain complicated any clear-cut appropriation by altering the appropriated object and then subjectively translating it onto canvas. 500 SL #1 is disorienting in its surreal reinterpretation of the everyday. By slowing down the viewer with an altered image, Cain provided commentary on the way we consume products and images. Born in Orange, New Jersey, Peter Cain attended Parsons School of Design and the School of Visual Arts in New York City. He is often referred to as "the car painter" and with good reason: of the sixty-three canvases he made in his brief career, fifty-four are the now iconic large-scale, veristic paintings of automobiles for which Cain became increasingly known in the late 1980s. In 1989 New York's Pat Hearn Gallery showed Cain's latest series; those elongated, slick, and vertically upended sports cars signaled an evolution in the artist's work. 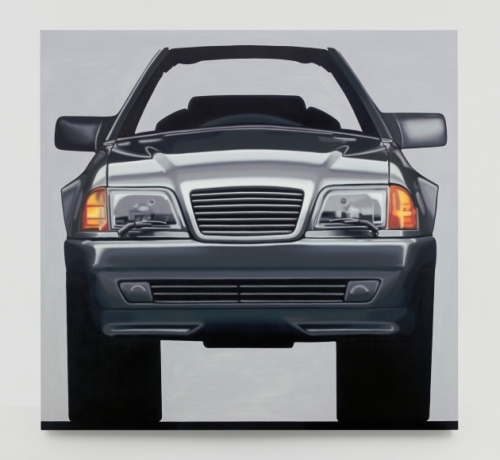 Cain's works from 1992 to 1995 — groundbreaking portraits of distorted, heavily manipulated, highly evolved cars and jeeps —were seen widely in the mid-1990s when they were included in a multitude of exhibitions, such as the 1993 and 1995 Whitney Biennials. Art critic Jerry Saltz lauded Cain's work as a "pivot point" in the return of painting to critical acceptance from its low regard by many writers and academics in the early 1980s. Cain's career was cut drastically short one month before the opening of his third solo show at Matthew Marks Gallery in 1997, when at age thirty-seven he suffered a fatal cerebral hemorrhage. That critically praised exhibition signaled a departure from his signature sub-ject, featuring large-scale paintings of the artist's boyfriend, Sean, lying on the beach, his face cropped in much the same way that Cain would truncate the hood of a Jeep or Porsche.